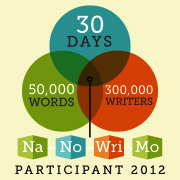 The NaNoWriMo Report Card: An Excel-File to keep track of your daily output. The NaNoWriMo-Wordcount Calendar: A very pretty calendar. Ready made for printout on your home printer. And don’t miss this years Scrivener discount. Scrivener is just the best writing tool out there. Go and get it for 20% less. Everything is explained on the linked page.